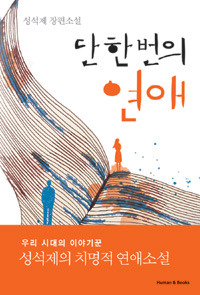 The first long romance novel written by writer Seokje Seong, who is called the ��storyteller of our generation��. The novel was written in a short time from summer 2012 to early winter in the shape of the original work. The story is of a small boy who is completely charmed by the daughter of a whale catcher during the entry ceremony to his elementary school entrance ceremony. It narrates his love, healing, and salvation until he becomes a middle-aged man. Writer Sung Suk Jae generously uses his characteristic humor, insight, and the experience of his generation to draw the natural universal human theme of love and salvation in detail as if it is real. The aesthetics of love that is ecstatic, sweet, yet fatal and the essence of romance as it repeatedly switches back and forth between deep frustration and extreme delight is drawn humorously and pleasantly, and sometimes in a deep, touching manner that makes the heart throb. At the same time, the process in which the main characters, who are part of the baby boomer generation that is the main force behind society today, find and incarnate love over the violence of the generation and every day is also interesting.